We’re barely into twenty fifteen and we’ve already pushed a major version update to Custom Login, which saw a few major bugs in it’s 3.0 debut. 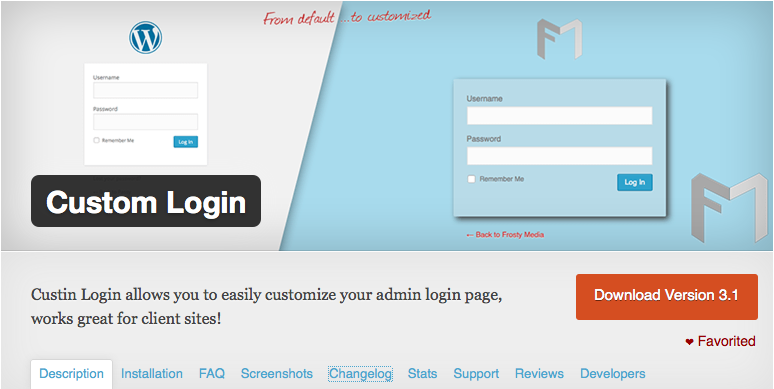 We welcome Custom Login 3.1. In version 3.1 we’ve removed a few small features that caused errors and big bugs and added some speed improvements to the already speedier 3.0 release. Revert back to WordPress login.css stylesheet. Remove all possible exactable files found in ACE.js. Moved the Custom Login Extensions install page. And that also goes for the 40 or so other changes made after the release of 3.0. Mainly this is for personal and client use. Some may want to put it to use (activate it) to view the latest news posts and recent released plugins. But, many may want to ignore or not see another dashboard widget. By default the Frosty Media dashboard widget is in-activate. So, you won’t have to do anything. As a whole all of my downloads have surpassed 500,000 downloads and Custom Login is now creeping up of the same milestone. With 480,000+ downloads it’s a matter of months weeks days Celebrate 500,000+ downloads?